Updated and final January 10, 2018: When we released the rankings we encouraged you all to discuss them as a key part of LetsRun.com is the knowledge of our visitors on the forum. You all convinced us that we were wrong and we’ve moved Hyvin Kiyeng from #2 to #4 in the rankings. With few professional events on the running calendar until 2018, LetsRun.com is once again rolling out its year-end rankings of the mid-d and distance events (2014 rankings here; 2015 rankings here; 2016 rankings here). From now until the end of the year, we’ll be ranking the top 10 men and women in the world (plus the top five Americans) in the 800, 1500/mile, 3000 steeplechase, 3,000/5,000 and marathon. We hope you enjoy reading these rankings as much as we enjoyed putting them together. An emphasis on performance in big races. How the athlete fared at the World Championships is obviously a major consideration but winning gold doesn’t guarantee that an athlete will earn a #1 ranking. For U.S. athletes, their performance at the U.S. championships also factors heavily in the rankings. What a wild year in the women’s steeplechase. It was a year that saw the membership of the sub-9:00 club double, from two to four (Kenyans Celliphine Chespol and Beatrice Chepkoech both broke the barrier). It was a year that saw 21 of the 31 fastest times in history (68%) run. It was a year that saw a woman run the #2 time in history (Ruth Jebet‘s 8:55.29 in Zurich). And yet, when the dust settled, it was two Americans, Emma Coburn and Courtney Frerichs, who wound up with the gold and silver medals from Worlds in one of the greatest races in the history of U.S. distance running. Though their season’s bests of 9:02.58 and 9:03.77, respectively were only the ninth- and 12th-fastest times run this year (still enough to put them #6 and #8 on the all-time performers list), those were the two fastest times run on August 11 in London. Though Coburn was the world champion, she was not our World #1 — in four Diamond League appearances, her best finish was fourth place. But that doesn’t cheapen what she did in London, where she took on the toughest, deepest championship steeplechase field ever assembled and won by running an American and championship record. The result was not only the U.S.’s first global steeple title, but just the fifth World Championship gold by a U.S. distance runner, joining Mary Decker‘s 1500/3k double in ’83, Mark Plaatjes in the marathon in ’93, and former training partner Jenny Simpson in the 1500 in ’11. It’s still tricky, though. Kiyeng finished higher at the big one — Worlds — but was still only fourth overall. And though this isn’t reflected in the standings, Chepkoech’s fitness that day was worth far better than fourth considering she missed the first water jump, fell on another barrier and still led at the bell. So why did we pick Chepkoech? Considering everything else was so even, the main reason was the sheer number of elite performances she produced. In the deepest year ever (by far) in the women’s steeple, Chepkoech was the most consistent, logging four of the top seven times in the world this year (no one else had more than one). Chepkoech ran 9:01.69 in Paris on July 1 (a race in which she beat the four other contenders for World #1). Had she run that time last year, it would have been the seventh-fastest time in history and would have made her the third-fastest performer ever. Had she run that time in 2015, it would have been the third-fastest time in history and would have made her the third-fastest performer ever. The thing is, Chepkoech’s 9:01.69 in Paris — which, as it stands, is the 13th-fastest time ever run — was only her fourth-fastest race of 2017. That sort of consistent excellence carried Chepkoech to the #1 ranking — despite only winning two races (Paris and the Kenyan Police champs). As mentioned above, the battle for #1 came down to Chepkoech and Kiyeng, and so we’re inclined to go with Kiyeng for #2. Ruth Jebet did run faster and win the Diamond League final, but Kiyeng was 3-2 against Jebet, and one of those races came at Worlds. Thus we go with Kiyeng just barely ahead of Jebet. 1/10/2018 Update: While we said the #1 came down to Kiyeng vs Chepkoech we were missing the forest for the trees, just looking at all the head-to-heads among the top 5. 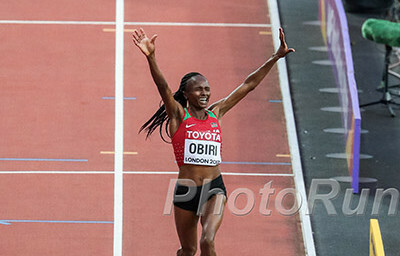 As poster, “head to head” pointed out, Coburn beat Kiyeng at the two biggest meets of the year, Worlds and the Diamond League final, and won the World Championship in the process, while having a season’s best that was only a couple seconds slower. That logic convinced us that Coburn should be ranked ahead of Kiyeng. We still like Jebet’s season better than Coburn’s and are thus moving Kiyeng down to #4 with Jebet moving up to #2 and Coburn up to #3. Jebet at #2 makes sense. She had a huge win and fast time at the Diamond League final, but was not nearly as consistently good as Chepkoech. There’s certainly an argument to be made that Jebet, the Olympic champion and world record holder, should be #1. 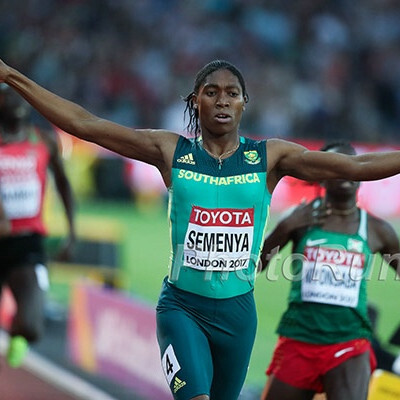 After all, she had the performance of the year when she crushed everyone in the Diamond League final in Zurich, running the #2 time in history (behind only her own 8:52.78 in Paris last year) and revealed after that race that her disappointing fifth-place finish at Worlds was due in part because she felt sick and had a headache. But Jebet’s mid-season slide — 3rd at Pre, 4th in Paris, 5th at Worlds — was enough to push her down to #3 #2 in a loaded year for the steeple. Coburn’s race at Worlds was amazing, inarguably one of the best races of the year and one of the most meaningful in the annals of American distance running. But there’s a reason why it was viewed as a huge upset: until Worlds, Chepkoech, Kiyeng, Jebet, and Chespol were on an entirely different level than Coburn. In the first four DL meets (we’re counting Shanghai, even though it wasn’t a Diamond Race event), the slowest time by Chepkoech, Kiyeng, Jebet, or Chespol in a DL race was Jebet’s 9:10.95 in Paris. She still beat Coburn in that race. The second-slowest time was Chespol’s 9:07.54 in Paris. That time was faster than the American record. Coburn wasn’t running poorly — she barely missed the AR at Pre and ran 9:11 in Paris — but she was nowhere close to the top women in the world. A medal at Worlds would require an American-record-type performance. 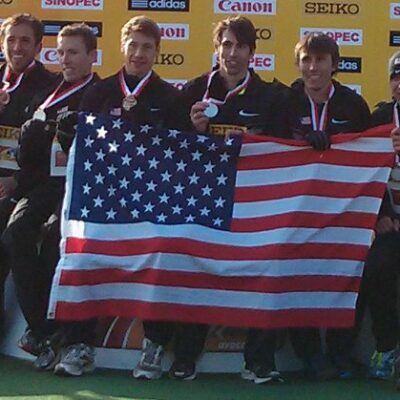 Winning Worlds would require an American record and the Kenyans running poorly. And of course, that’s exactly what happened. But that doesn’t change the fact that Coburn wasn’t close to the world’s elite before Worlds and wasn’t close afterward (she was fourth in the DL final, 19 seconds behind Jebet, 15 behind Chepkoech, and nine behind Norah Jeruto). She’s the world champ, but she’s not World #1. Update: At the end of the day Kiyeng was consistent but didn’t have the big wins that Coburn and Jebet had or the incredible time that Jebet ran. She got beat by Coburn at the two biggest meets of the year and thus settles in at #4. You’re probably wondering why American silver medalist Courtney Frerichs hasn’t shown up on this list yet. She’s coming, but you can’t put her above Chespol. Yes, Frerichs beat Chespol convincingly at Worlds, but Chespol destroyed Frerichs in Doha and Eugene, set the African record of 8:58.78 to move to #2 on the all-time list and broke 9:08 four times (Frerichs broke 9:19 once). Chespol also won the highly competitive Kenyan trials. She was clearly the better runner over the course of the year. Jeruto didn’t run Worlds (or even the Kenyan trials) but she just pips Frerichs for sixth. Here’s why. Frerichs had one incredible race (9:03 for second at Worlds), and two solid ones (9:19 for fifth at Pre, 9:22 for second at USAs). Jeruto had three great races (9:05 for third at the DL final in Zurich, 9:03 FTW in Berlin, 9:04 FTW in Zagreb, all in a six-day span at the end of the season), a Diamond League win (in Oslo in 9:17), another sub-9:20 in Shanghai (9:15), and four more races under 9:23. She raced significantly more than Frerichs, and though Frerichs had the higher high, Jeruto produced far more quality performances. After finishing 11th at the Olympics off of low-mileage college training, Frerichs clearly had room to improve after joining renowned steeple coaches Jerry Schumacher and Pascal Dobert at the Bowerman Track Club last year. But no one could have predicted 9:03 and a World Championship silver from a woman who entered the year with a PR of 9:20. While Coburn’s win at Worlds was surprising, she had been contending with the top Africans for the past few years, including an Olympic bronze in Rio. Frerichs, meanwhile, had shown nothing to indicate she was capable of medalling, though she entered Worlds knowing she was a lot fitter than her 9:19 PR at the time. 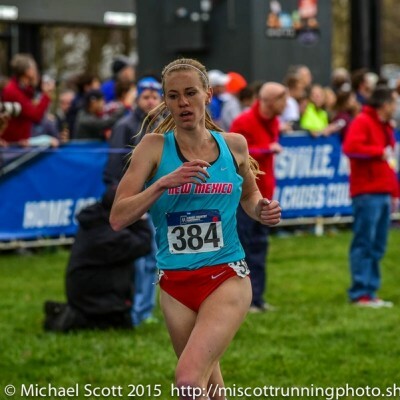 It turns out she was 16 seconds faster than that PR; if Coburn hadn’t PR’d by five seconds herself, Courtney Frerichs would have been the 2017 world champion. Now that Frerichs is a World Championship medalist and the eighth-fastest woman of all time, the expectations will be different in 2018. Coburn has reigned over the event domestically for half a decade, but Frerichs showed in London she is ready to challenge that supremacy. And with no major championship next year, the race will be on between Coburn and Frerichs to become the first American under 9:00. There are Diamond League steeples in Rome, Oslo, Paris, Monaco, and Brussels next year, so fans of the steeple should watch those meets closely. Krause, the 2015 World Champs bronze medalist, was a little off her game in London (ninth), but she was consistently under 9:20 on the circuit, opening her season with a 9:15 national record in Doha, earning her first DL win in Rabat in 9:18 and closing the year with another German record of 9:11 in Berlin. She also managed a sixth-place finish in the DL final. Assefa had a solid year, with her most impressive win a 9:07 solo effort in Hengelo that doubled as an Ethiopian record. She broke 9:20 on three other occasions. Diro beat Krause at Worlds, but she wasn’t nearly as good on the circuit, only managing to break 9:20 once on the year. 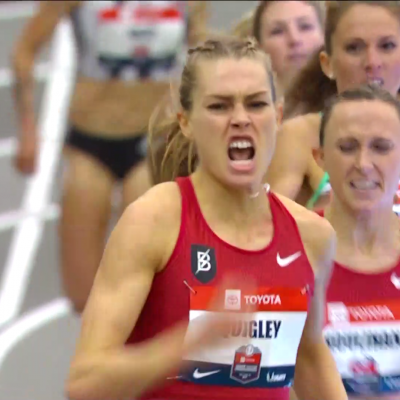 Quigley was third at USAs and would have made the final at Worlds had she not been DQ’d for stepping on the line coming out of the water jump — it was the correct call, but a ticky-tack one as it had essentially zero impact on the outcome of the race. Quigley did bounce back to run a PR of 9:15 in Berlin on August 27 to make her the fourth-fastest American ever, but it’s a shame she didn’t get to truly test herself at Worlds. Garcia just missed out on her first Olympic team in 2016 (she was second at the bell but fell at the final barrier and faded to fifth) and, perhaps due to that result, decided to make a change to her technique in 2017. But it was clear that Garcia was not comfortable with the change, and she admitted as much at USAs, where she faceplanted on one of the water jumps in her prelim and struggled to clear many of the barriers in the final, leading to a fourth-place finish. It’s a testament to her fitness that she was still able to finish the year as the #4-ranked steepler in the country, but if she is to crack the top three again, something has to change from 2017: either she reverts to her old form or becomes comfortable with her new form. Either way, she needs to be confident in her hurdling ability. Lack of confidence leads to hesitation, which leads to bad hurdles and costs time. One more thing: kudos for Garcia for acknowledging her issues and discussing them openly. Our interview with her after her prelim at USAs was one of the best we conducted all year. MB: What’s wrong with Stephanie Garcia???? There was a big gap after Garcia at #4, but Lawrence, who was fifth at USAs and ran 9:40 or faster on five separate occasions, was the obvious choice for #5.